Be it a humble bungalow or a sprawling mansion, a house is often the embodiment of the American dream. The Museum’s collections include many examples of American houses, both models and life-size structures. They reflect different ways in which Americans have defined the meaning of home. A masterpiece of craftsmanship, this ornate model was built by Leonard Roth, a Philadelphia shoemaker, and took ten years to complete. The house represents the French Second Empire style, which was popular in America from the 1860s to 1880s. 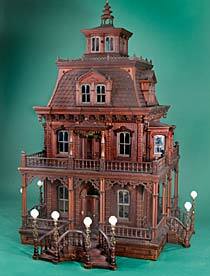 It features a double spiral staircase, elaborate gingerbread trim, and mansard roof. With meticulous attention to detail, Roth outfitted the house with windows, a doorbell, and gaslights that actually worked.